I wasn't sure if this week's Nail Polish Challenge could be done. I looked all week for a Christmas ornament or something that would match, but nothing was quite tacky enough. My friend Emily, however, rose to the occasion - she found a sparkly Steve Madden heel that matched my Sparkle-icious polish exactly!! 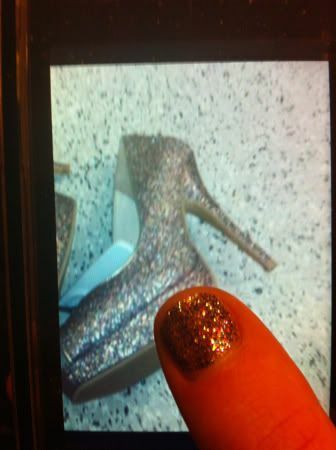 The one minor detail is that the shoes and my nail polish were never in the same room together. No matter. Posted in Style and tagged with Nail Polish. December 6, 2010 by Adele Chapin.